The world is updating day by day not only technologically but also mentally. Thinking of each person is also modernizing with lifestyle. Life is a struggle and men are eager to find out happiness through gaming inside their straggling biography. Bushnell Pro x2 is a very popular golf rangefinder in the market. Some people only buy Bushnell as rangefinder as it has been holding its reputation among the customers for so long. Bushnell golf rangefinder hybrid is another addition to the Bushnell series which also gained popularity like the previous additions for its quality. PinSeeker with JOLT technology for exact distance measurement. Its slope switch technology for compensated calculations. Two different colored display based on the lighting condition. Its 6x magnification for crisp and clear visuals. Why should you choose Bushnell Pro x2? Reliable slope switch technology - its patented slope switch technology gives the player a compensated distance based on the hole’s incline or decline. It also turns off for an USGA-conformation device. PIN Seeker with Jolt technology - For eliminating doubt of having locked onto the flag its pin seeker is very useful. bushnell advance PinSeeker technology is a game changer it been engineered until all of Bushnell laser rangefinder its a total breakthrough with PinSeeker technology you can easily lock into your target with incredible accuracy. simply press and hold down the power button when the circle surrounded the pin seeker indicator you have confirmed that multiple objects that have been acquired but only the distance to the flag is displayed. It is wrapped nicely in full metal housing and is IPX7 waterproof. Dual Display technology(DDT) - Based on the personal preference or lighting condition you can use the dual display of Bushnell Pro x2. You have to toggle between the sharp black display or the vivid red display by simply pressing the mode button. 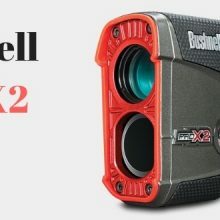 What is interesting about Bushnell Pro x2? You will get all the latest technologies packed into Bushnell Pro x2 laser rangefinder. The jolt technology gives the golfer short vibration to confirm that the laser has locked onto the flag exactly. To feel the accurate distance, Bushnell golf rangefinder jolt is the best. Depending on the degree of slope, its slope switch adjusts and calculates the yardage. It is a premium golf rangefinder which adds confidence to the golfers’ performance. Bushnell Pro x2 rangefinder has a rubber armored, waterproof metal housing. It has 1 CR123A batteries required (included). Its field of view is 393 feet at 1000 yard, and eye relief is 16mm. The exit pupil is 3.5mm which is accurate to the ½ yard. It has a class one laser with less than 0.5mW average power output. here is a 1 year limited manufacture warranty. Does the rangefinder have a lock on? Ans: Yes. The rangefinder has a short vibration when the target is locked on. Can I use this golf rangefinder for hunting? Ans: Yes, with limitations .However, it works better in open areas. Actually it’s made for golf. Does the viewfinder work well while wearing glasses? 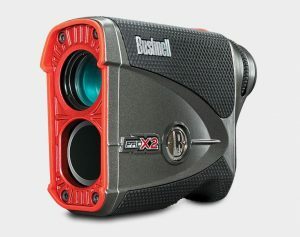 Bushnell Pro x2 laser rangefinder is an amazing choice for the professional golfers. Its size is very much favorable to carry it anywhere you want. Its service is well recognized by the customers for a long time. You will not regret buying it. It will give you back the amount you pay for it as a good service.